No, I’m not talking about the potato in Turlington, or even the French fries outside of Marston. I’m talking about the pounds of potatoes you’ll be consuming next Thursday at your Thanksgiving feast. Seeing as we now live in a health conscious society, you’re probably wondering: how do you choose between sweet potatoes and regular (white) potatoes? Were you like the majority of the Orange and Blue staff and thought sweet potatoes were a healthier choice? Well — we were all (somewhat) wrong. After bit of research, I’ve discovered that sweet potatoes and regular potatoes only have a difference of about 25 calories (that is for a 6 ounce potato). However, sweet potatoes have significantly more fiber, meaning you’ll feel more full for longer. Any other day of the year and that is a great dieting tip, but for Thanksgiving, the day you gorge yourself in food, you might want to go with the potato that is less likely to fill you up. 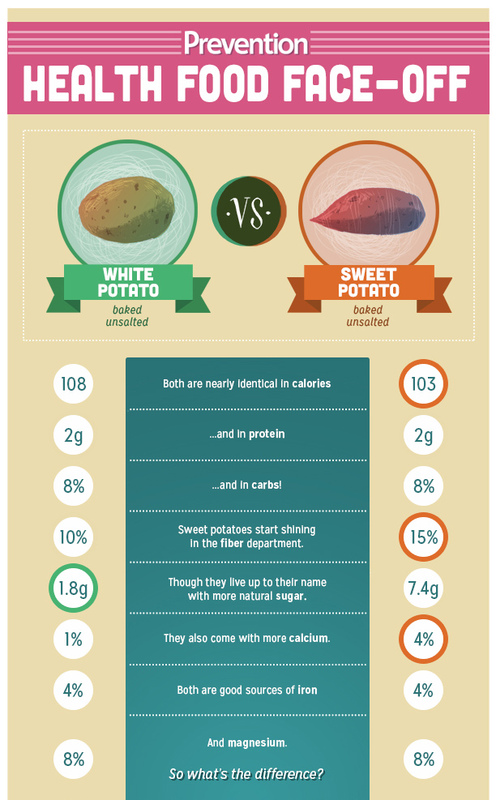 Check out the comparison created by prevention.com below to see a full comparison between sweet and regular potatoes. Next Next post: Orange & Blue Magazine Event!